For the past year or so I have been reading blogs on a weekly basis. But recently it has been on a daily basis and in total I probably read 150+ blog posts a week. It does take up a lot of my time and maybe sometimes I should be writing a post instead but I love reading other posts. I love knowing more about bloggers and a glimpse into their life. I am also attending BritMums Live for the first time ever next June and I am so nervous. I love all the different topics everybody writes, parenting, traveling, places to eat, pregnancy, fashion, and a lot more. Sparkles and Stretchmarks written by Hayley. I have known about this amazing blog for quite a while but for the past couple of months I have been reading her blog on a weekly basis. I am really interested following her surprise pregnancy and I love reading her updates. I love how she shares some great informative posts with various topics. Kerry's blog has been my all time favourite. I have followed Kerry's blog since I started blogging and it's amazing how much and how quickly her blog has grown. I love following updates on her beautiful daughter, Amelia and son, Harry. Her home interiors are stunning. She really is an inspirational blogger. More recently she has been sharing her blogging tips which are fantastic and so helpful whether you are a newbie blogger or been a blogger for a few years. I have only been reading Chloe's blog a few months ago when I found her and I have been enjoying reading her blogging tips, day out posts and other posts. She has some beautiful photos and I really enjoy reading her tips for mums. They have really helped me in ways and inspirational posts. Catriona started blogging through me and she is one of my best friends and my nephews Mam. I absolutely love reading posts about my nephew, Osian and her photos are fantastic. I love the way she writes and reading about her adventures with Osian. Seri is one of my best friends! She actually just lives down the road from me and she also started writing her blog through me. She is a newbie blogger and will be sharing her bakes, days out, and other topics including her two beautiful children, Aishah and Ismail. Take a look. Alex's blog has been another of my all time favourites. I can't remember exactly when I discovered Alex's blog but ever since I have loved reading her posts. I love reading her updates about her beautiful sons Ethan and baby Logan. She has started something new called #MyMonthlyMontage which is something I will be following and interested to follow. Of course this lovely lady co-hosts #justanotherlinky with me and I love reading her blog. I love reading about her adventures with her beautiful children and I love her Sunday photos! Definitely someone I would love to meet one day soon. I love reading Kaye's blog, Helloarchie. Her photos are just beautiful. I love her style of photos and writing. I do find her blog completely different to every other blog I read. Her blog design is lovely and she is another inspirational blogger. I love her posts about what Archie wears and her days out with Archie. There you go! 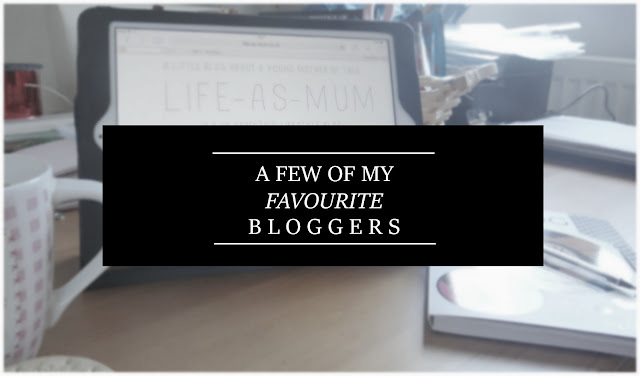 These are just a few of my favourite bloggers and they are listed in no particular order. You can see a list of my favourite blogs here but there are more I do need to add to the list. I will get round to it one day. So keep checking up. I hope you've discovered some new blogs through this post and my page.